Crack another case with Ardis Cole. Archeologist Ardis Cole vis summoned to Scotland at the request of her longtime friend, historian and writer, Bruce McBrier. Bruce has found a skull on the grounds of his castle that he believes to be his ancestor, killed in a medieval battle. He wants Ardis to do a facial reconstruction of this historical figure. When Ardis discovers the skull is of a recent murder, she finds herself having to evade a killer intent on stopping her work. 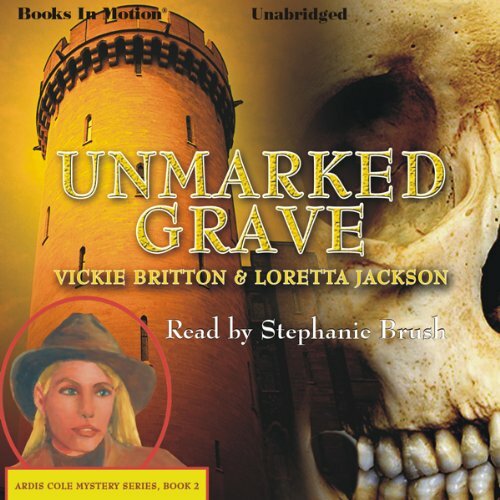 Unmarked Grave is a suspenseful mystery full of twists and turns, expertly written and narrated. It gives vivid glimpses of Scotland and makes me want to see the country for myself. I look forward to reading more of these exciting adventures! A bit boring and disjointed.Dont waste your money! Not a bad yarn as such. However the story line stretches the imagination as the main charactor and the spunky Scottish Copper seem to fall instantly in love .Plot thin. Charactors transparent.Love plot anorexic. Lots of Ye Olde Scottish folklore stuff with big castles.